Fog season is with us once again. 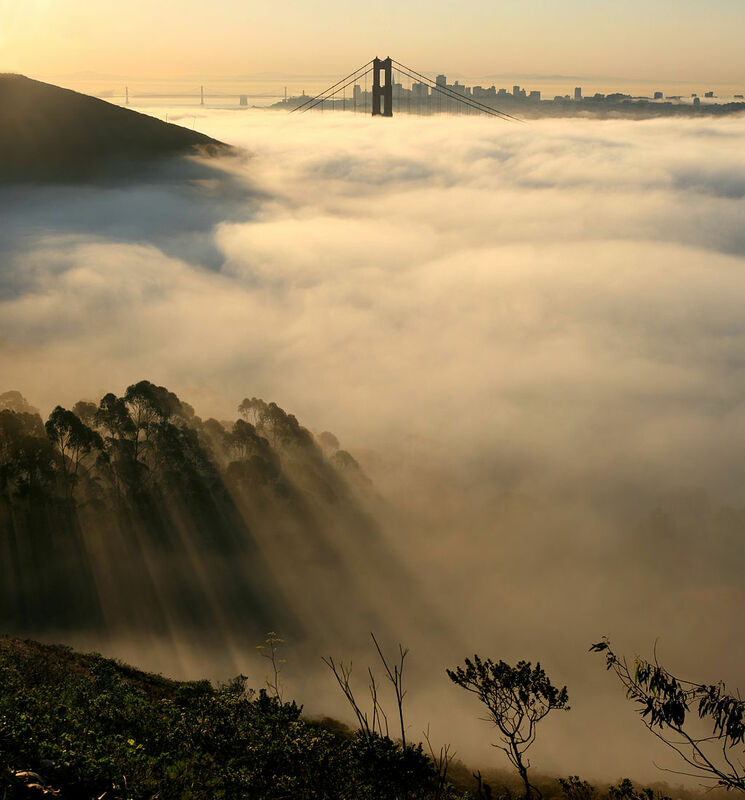 And whether it's the ground-level “pea soup” of legend or the looming overcast known as the marine layer, there’s a reason it’s called California's natural air-conditioning: fog and clouds are vital cogs in keeping the coastal thermostat turned down. But that advantage could be disappearing. KQED Science Editor Craig Miller talks with climate scientist Park Williams about his recently published work on California's vanishing clouds. Williams is an assistant research professor at Columbia University’s Lamont-Doherty Earth Observatory in New York, but the gray mantle of the California’s summer coastline keeps drawing him back here -- and it’s not just the romance of it. It turns out that fog -- any kind of cloud, actually -- is a great regulator not just of heat, but of drought. Park Williams: Yeah, fog regulates drought. It does it in a couple of ways. In ecosystems, fog drops water directly on plants. And when the water collects on the plants, it then drops into the soil and is available for the plants to use. Fog, and clouds that are higher than fog, also shade the sun, and that allows plants more time to use the water they've collected from the fog. In cities, fog and clouds that are higher than fog -- overcast clouds -- are important as well, because they regulate surface temps. Craig Miller: And it seems like cities are where the problem is. PW: We looked at Southern California and found that in large cities -- L.A. and San Diego -- the heights of low clouds during summertime have been increasing; they've been rising away from the city. CM: Why would that be? PW: Cities have been warming, and essentially you need to go higher into the atmosphere before you finally get to where it's cool enough to have water droplets condense and clouds can form. CM: This is sounding like the "urban heat island" effect at work here. Is there a smoking gun for that? PW: The minimum temperature at night has been rising rapidly. During the daytime we've seen slow warming, but not nearly at the pace that nighttime warming is. That's the fingerprint of the urban heat island that we expect. The urban heat island effect really is a nighttime phenomenon because cement takes a long time to get rid of its heat, and that causes nighttime temperatures to rise. CM: And where urbanization reaches inland, like, say, the Inland Empire region east of L.A., this phenomenon seems to follow. For example, looking at readings from airports, you found there's 87 percent less fog in Ontario since 1950, and that overall cloud cover -- technically the “frequency” of clouds -- has been reduced by about half. That's stunning. PW: That means Ontario is getting a lot more sunlight in the morning hours, which is then feeding back to heat up Ontario and make clouds less likely in the future. CM: You're describing a kind of vicious cycle. PW: Clouds will become thinner over Los Angeles. That allows more sunlight to be absorbed by the ground, which causes more surface heat, which causes clouds to have to form higher up, which causes clouds to be thinner, which perpetuates this process of more sunlight, higher clouds -- and eventually more sunlight, no clouds. CM: But you don’t foresee fog and overcast vanishing everywhere along the coast, only in the most urbanized areas? PW: It depends on where you are. Since these fog and low marine clouds during the summer are regulators of drought, and since global warming is projected to enhance drought in much of California, these clouds could be very nice moderators of the global warming process and increased drought in coastal California. PW: Then we see basically the moderating effect of these clouds probably getting canceled out, and rapid increases of drought in the mountain ecosystems surrounding the cities of Southern California. CM: It sounds like when you get north into the coast redwoods, which are so dependent on the fog, the prognosis isn't so bad. PW: I think it's not so bad. We'll have to wait and see. Certainly these clouds are complicated and there are aspects to them we still don't understand so well. We've had a tough time getting computers to actually model the behavior of these clouds. CM: It makes you wonder if we might come to miss the June Gloom. PW: I think the ways it'll be missed are -- energy bills rise because everything's warmer, heat waves will be warmer and that'll have some public health implications. But there'll be benefits, too. People like going to beach when it's sunny and not cloudy, so June Gloom gets in the way of family vacations. It'll be nice to have better beach weather. CM: I'd call that a silver lining except I think you need a cloud for that.